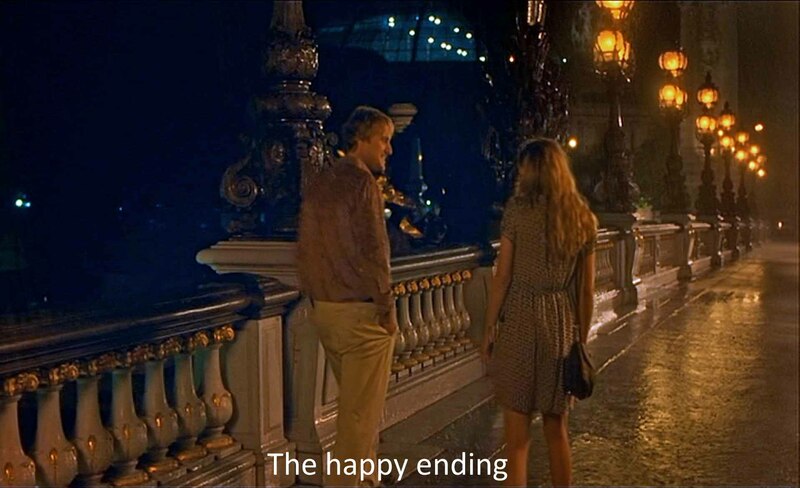 Woody Allen, Midnight in Paris, 2011. Enjoying: Nostalgia is one key idea in this film. So just enjoy your memories of Paris, if you have them, or your hopes about Paris if you've yet to go. I'd save the essay for after you've seen the film. This is a movie that celebrates personal transformation. Our hero finds the courage to do what anybody would have had the sense to do at the beginning of the picture, namely, dump his materialistic fiancée so plainly not right for him. But no guts. Lackadaisical. Mixed-up. Something happens to give Gil the gumption to do what he needs to do—what? To recapitulate: this is a film about an artist—a writer, more precisely—who is trying to find his way. (He is often lost in Paris.) 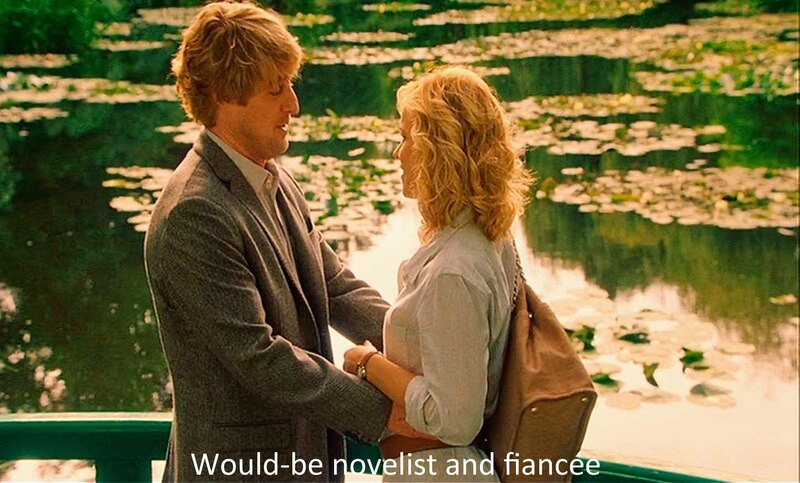 Gil Pender (Owen Wilson, playing Allen’s characteristic ineptitude) is trapped in a high-paying but unsatisfying job as a screenwriter and film fixer in Hollywood. But he wants to Write A Novel. He even has a manuscript of the novel, whose hero is a man who works in a “nostalgia shop,” selling the throwaway artifacts of decades past. And there are people he mostly hears: Cole Porter and Sidney Bechet. 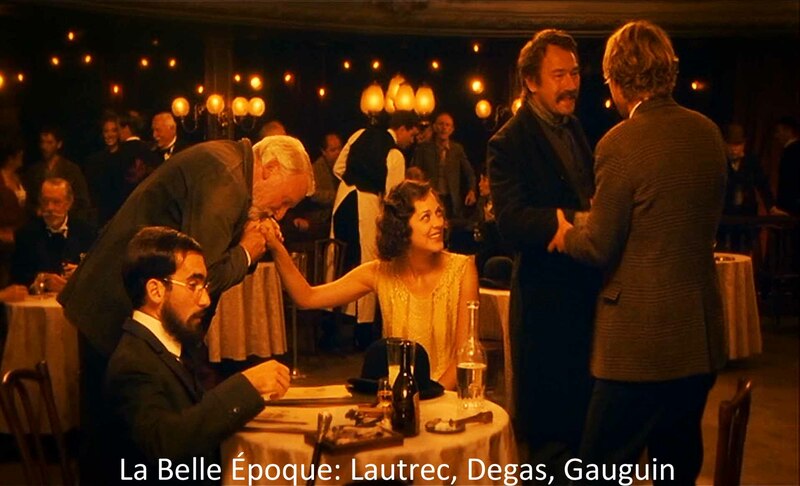 And he chats up Adriana (Marion Cotillard), a would-be costume designer, previously the mistress of Modigliani, Braque, and Picasso, in that order. He falls in love with her. But Adriana doesn’t love Paris in the 20’s as he does. For her, it is a dull and painful present, and she expresses her longing for a yet more previous time, the Belle Époque. She and Gil travel back to Paris in the 1890s. There, at Maxim’s, they meet yet another astonishing crowd: Degas, Gauguin, and Toulouse-Lautrec (no, not José Ferrer this time). And these three in turn long to return to the Renaissance. Gil realizes that this longing for a previous time—a previous artistic community—can never be. He resolves to stay in Paris and write his novel. He dumps his fiancée and her Republican parents, he gives up life in Hollywood and Malibu, and he starts to settle into the kind of life he wants to live in Paris. As a start, he picks up a pretty French girl who works—where else?—in a nostalgia shop. So what gives Gil the gumption to abandon his materialistic life and the people that go with it? You could say the city, Paris, transforms Gil. Woody Allen loves cities. As in his earlier masterpiece, Manhattan, this film pays tribute not just to one city, but cities in general for having a kind of transformative power. None of this back to nature stuff, not for Woody Allen, for whom Los Angeles is too rural. 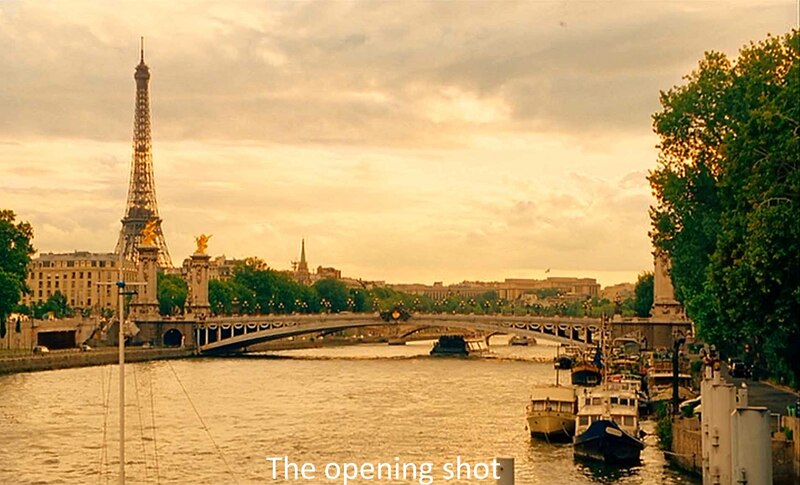 Gil certainly talks as though Paris has changed him, and Allen opens the film with a long picture-postcard, gold-tinted tribute to Paris accompanied by a full three-minute rendition of “Si Tu Vois Ma Mère” by Sidney Bechet, the first of those many expatriates enjoying and creating in Paris. The city, from earliest times, from those first sunbaked settlements in the sandy crossroads of Mesopotamia, has been a place where artisans and artists collect. Allen is paying tribute to the city but, in particular, the city as home to the arts and the artistic community. But it is not Paris of the present day that gives Gil the courage to change. It is Paris of the 1920s where he himself can never be—except after midnight. He’s a kind of reverse Cinderella. Neither is it the art he sees that prompts Gil to change. We see only two works of visual art, Rodin’s The Thinker and a minor “portrait” by Picasso. We get two fine songs by Cole Porter. We hear the first (rather good) sentence of Gil’s novel about a man who works in a “nostalgia shop,” selling the cultural throwaways of earlier times. That’s it. What we really see are the writers and artists themselves, that amazing collection of talents that came to Paris in the ‘20s. The film comes to its full metafilmic circle when in Gil’s daylight here and now, he re-encounters a guide (Carla Bruni, no less—how did Allen get her to do this?). She translates for him a book he has picked up from one of Paris’ boquinistes. It turns out to be a memoir by Adriana which mentions him. 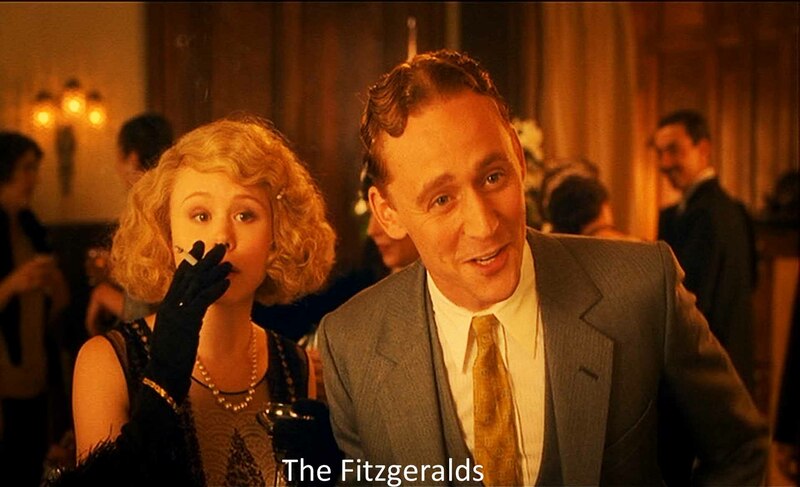 Was he really there, in that twenties scene? Impossible! 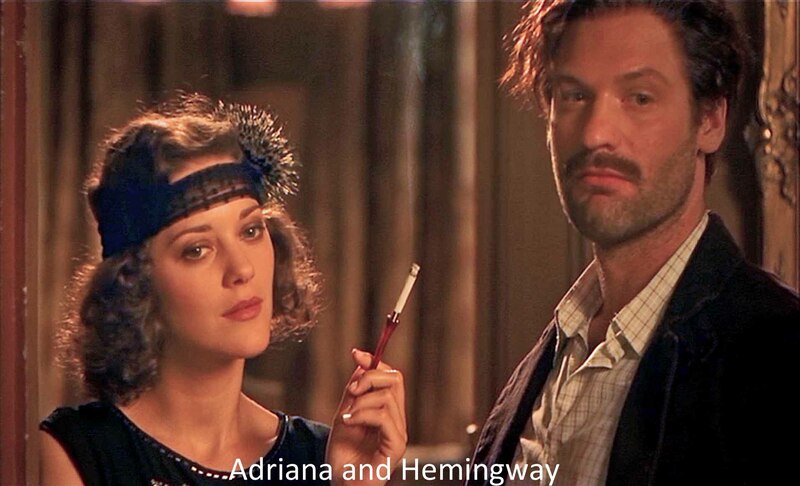 The impossibility of Gil’s and Adriana’s nostalgia for an even earlier period—nostalgia is a key word in this film—leads to what sounds like the take-home moral for this picture, the idea on which it pivots. Don’t long for some idealized previous era. In effect, Gil’s midnight partying takes him into the nostalgia shop of his novel. Rather, we have to face up to the pains and frustrations of life in the present (and its joys). It’s what we have. The past is past. It’s over. That’s the easy message of the film, but it’s too easy. What Gil really wants to go back to is not so much an idealized previous era. Even Inez’ obnoxious mother shops for old furniture. Gil wants the artistic community of Paris in the ‘20s—or the Belle Époque or the Renaissance. What the movie shows us is the world of the artists in an idealized but bygone time and place. The point is, if we enter such a world, one created by writers and artists, it will change us. No, that’s not right either, not in this film with its ironies piled on ironies. It’s not nostalgia, some surreal time travel, some magic realism, not by itself anyway, that enables Gil to get out of his materialistic rut. What transforms Gil is the magical experience of living in another era, an experience made possible by an artist-magician who can bring such a world into being, namely, Woody Allen. He is up to his old tricks. His heroes and heroines can be happy in their fantasy-worlds, not necessarily in their “real’ worlds. As in Zelig or, what may be his best film, Purple Rose of Cairo, Allen conjures up a magic realism or magic surrealism that seems to change the heroine. Seems. To me, the great irony of this film of many ironies is that Allen, himself an outstanding director of film, should dismiss screenwriting as an art form in favor of the traditional novel. Surely, by 2011, we had realized that the movie, at its best, can stand alongside the greatest of novels as an art form. Oh well. 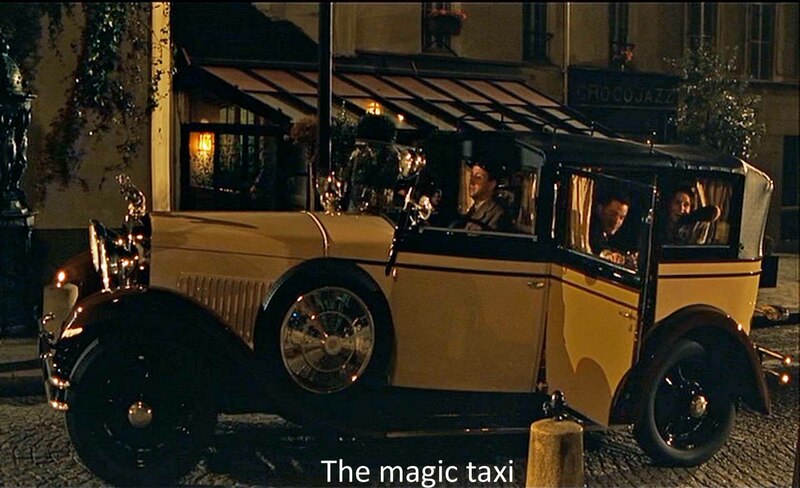 What goes on in Allen’s mind I will never know, but one thing is clear, he has created an utterly charming film in Midnight in Paris, one worthy to be shown alongside his best. Here, as before, he has opened up for us what we do to and for ourselves when we enter a world of fantasy. Or, more exactly, how entering such a world can let us change ourselves and find whatever happiness is possible in what Allen sees as this dreary real world. Enjoying: this isn't a film that needs a lot of afterthought. Just run over it in your mind and savor.